Who is the beast(antichrist) and what is his mark? Multitudes of people have speculated on the meaning of the number 666. They have tried to apply it to different people to see who is the antichrist. However, God wants you to be able to identify this enemy of righteousness by using the Bible. View a list of Prophecies that will help you as they have helped others throughout the ages. God does not want anyone to receive the "Mark of the Beast" and His prophets have written the necessary information in the Bible, that everyone who desires to follow God and His way can avoid receiving the "mark of the beast." The "mark of the beast" is a way that the antichrist can identify those that follow and obey him rather than God. • The number 666 is the number of a man at the head of the "beast". • The number 666 is not the mark of the beast, it helps us identify the beast and its leader. 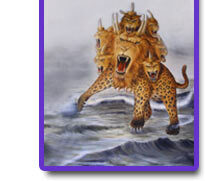 This beast(antichrist) has a "mark", a sign of authority that we dare not receive. Multitudes of people upon discovering this Bible truth will find out that they already have an association with the beast, however, God still loves these people and wants them to follow and obey Him rather than the beast. Listen to this message of Love from God found in the book of Revelation 18 verse 4. God calls these people, who have been deceived and are associated with the beast "my people", this verse should give everyone hope. Many of God's true followers are in need of hearing this message. Let him that hath understanding count the number of the beast: for it is the number of a man; and his number is Six hundred threescore and six."